For the Bloggers! Also makes a great gift! We can customize this gold foil print with your blog name or any social media platform name you use. Please email/message us for your custom requests! You will love to display this gold foil art piece as wall decor. Our prints come with a free mat. Print is 8x10; our free mat makes this a fit for a 11x14 frame. Please email/message us for framing inquiries and pricing. Our framed option includes the mat and frame for the perfect 11x14 display. 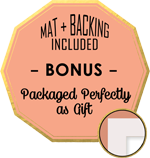 Our gold frame includes a single mat, while the white frame comes with a double air-lifted mat for additional depth.